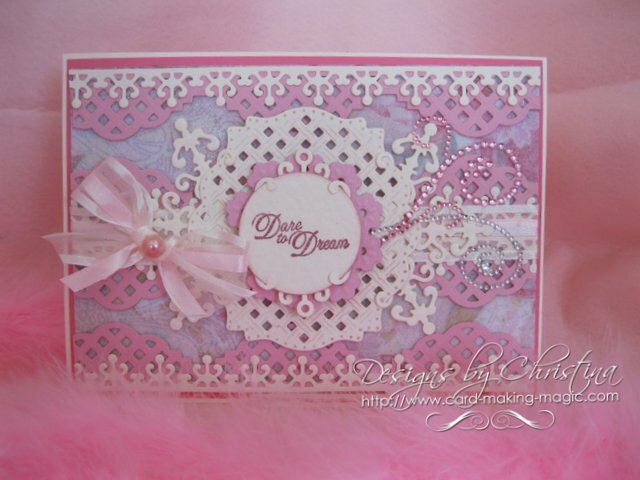 Matching Spellbinders Accents and Motifs will help you to create some really special designs. And having the sets to go with each other will increase the versatility of each set for a truly professional look that will make you proud to give each card that you make. There are many many sets of Spellbinders for you to choose and each time new ones come out they get much more intricate. They help you to make the most beautiful cards that will have your recipients pleased to receive any card from you. I know I have made Baby cards and the parent has said that this will go in a memory box for them to keep along with all the precious things one keeps when a new little person arrives in the world. So hear for you is a short Video Tutorial to show you some of the ways to get even more from your collection of Spellbinders dies. You will just have time to enjoy that cuppa as you watch the tutorial... and I hope you enjoy it and will try the ideas. Each of the Spellbinders Accents and Motifs will compliment each other ... but don't just stop there. Let your imagination roam free and see how they look with other sets. There are endless combinations as you build up your collection and every Spellbinder that you buy will work and blend with any other that you already have in your "Stash"
This card is created using the Cut, Fold, Tuck die called Spectacular Spin and it will marry up with any for a beautiful effect. The Spellbinders are not cheap but they will last you a lifetime with proper care and as you build up the ones you like then you need to get the most from them. The video Starting Your Spellbinder Collection will give you some tips on which dies to start off with.... but it is just my choice and there are many many to choose from. Then the video More from your Spellbinders will give you some ideas of how to use that basic set. But whichever set you decide to start with I would always recommend that you buy the Spellbinders Accents and Motifs of the same set. Then take the time to cut each set from some cheap paper and play. Se which shapes you like and layer them up with others. Turn them round... cut them up... tuck them behind other shapes .. fold them into rosettes ... create flowers ... need I say more ??? Just have fun as you play ... before you start to cut up your best card and then your confidence will grow.